Notes from the 2005 - 11th Summer Seminar in Alghero by Betysa Amiri and Betty Wood. Mangialavori describes how Cactaceae can help certain patients to live the last moments of their life in a dignified manner. Although these patients were too sick to expect recovery, their mental and physical condition improved sufficiently for them to take their leave in a peaceful way. In this book, Mangialavori sketches a more complete picture of the Cactus remedies, which have so far been thoroughly underrepresented in our literature. He describes Cereus serpentinus, Opuntia vulgaris, Opuntia alba spina, and Agave americana, among others. The chapters each start with a short description of the botanical plant family. 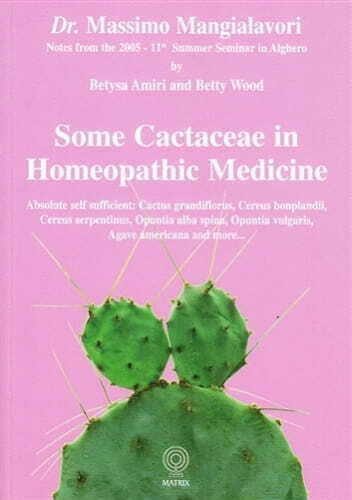 Then Mangialavori picks out the characteristic elements of the Cactaceae as homeopathic remedies by presenting the basic themes of this remedy group. The distinctive thing about Mangialavori's work is the precision and care with which he extracts information from the repertoire of strictly defined, healed cases. This book is no exception. With the help of his vivid and memorable cases, we can gain a deeper understanding of these remedies. An exceptional contribution to the homeopathic literature. Through his work as physician, Mangialavori discovered that the Cactaceae are uniquely suitable to help certain patients face their final moments of life with grace and dignity. Although too ill to hope for cure, these patients are able to feel better physically as well as resolve emotional issues and achieve a deeper appreciation of life. Mangialavori gives us a new perspective on such homeopathic medicines as Cactus grandiflorus, and Cereus bonplandii and paints a fuller picture of some of the Cactaceae remedies that are wholly under-represented in our literature such as Cereus serpentinus, Opuntia vulgaris, Opuntia alba spina, and (not a Cactaceae, but sharing the fundamental themes) Agave americana. Cactus Grandiflorus, Cereus Bonplandi, Cereus Serpenrinus, Opuntia Vulgaris, Opuntia Alba Spina and Agave Americana. In his introduction Dr. Mangialavori ex­plains that he often used the cactaceae in near-death situations, where people at the end of their life need to be helped to face the inevitable. The concept of destructiveness is evident in this remedy group and throughout the book we can read about how this destruc­tiveness came about. This is a book about a particular group of remedies in a particular family; as such it provides very condensed and interesting information. The main theme of this group of remedies is self-sufficiency. The cases and related materia medica help us to understand where this quality, in its pathological form, can lead to. In the chapter "Hierarchy" the author delves more deeply into the finer charac­teristics of the remedies with sub-themes. Through these sub-themes the remedy pic­ture becomes very clear, while the included full cases are a great extra help. Here the materia medica comes alive! The reader must be aware that this book is based on notes from a seminar. So it's not perfect in the sense that it was not especially written as a book. In effect, the seminar became a book. – A group of remedies previously un­known to most of us. – Thorough materia medica supported by well-documented cases. This compact totality allows us to prescribe these remedies in practice with confidence. There are photographs of each remedy in­cluded at the back of the book.